As a former moldmaker, Pete Mourouzis fully understands the need for speed and workmanship when it comes to tool, die and mold repair welding. As owner of Wicked Welding, Inc., Dayton, OH, Mourouzis applies his precision-welding skill and knowledge daily to help manufacturers return worn or damaged tools back to service. At his disposal are two welders, in addition to himself; an array of precision micro-tig (gas-tungsten arc) welding systems and traditional tig-welding setups; and two micro-laser-welding systems. Mourouzis and his team perform not only emergency-room repairs on tooling but also enjoy a thriving wellness program that has it included in some of its customers’ routers, performing planned maintenance-welding procedures. We walked around Wicked Welding’s 4000-sq.-ft. shop while welders were busy repairing mold tooling, and learned first-hand how the steady-handed team provides local customer Dayton Systems Group (DSG) with fresh carbide-insert stamping tools for its customers in the can-making industry. Wicked Welding’s Pete Mourouzis has two laser-welding machines at his disposal, to make tooling repairs—an 80-W manual machine (top) for hand-held work, and a 100-W machine with a three-axis rotary fixture table for more precise work. Both require him to perform three actions at once —foot-pedal control of the pulsed laser, right-hand manipulation of the part, and left-hand filler-wire feed into the weld. Shielding gas (pure argon) flows through the blue hose to protect the tiny welds from the atmosphere. Mourouzis launched Wicked Welding in 2003 after having worked for several years in small injection-mold shops. He spent three of those years running CNC machines and doing assembly work, and the last two as an inhouse welder. Mourouzis launched his company as a provider of traditional tig and micro-tig welding services, and made his foray into laser welding in 2005 with the purchase of a small LaserStar 80-W manually operated machine. In 2008 he added a larger 100-W Rofin model, equipped with a three-axis joystick-controlled table and rotary fixture. Both machines run pulsed-YAG lasers and feature a stereomicroscope and cross-hair for precision beam alignment. 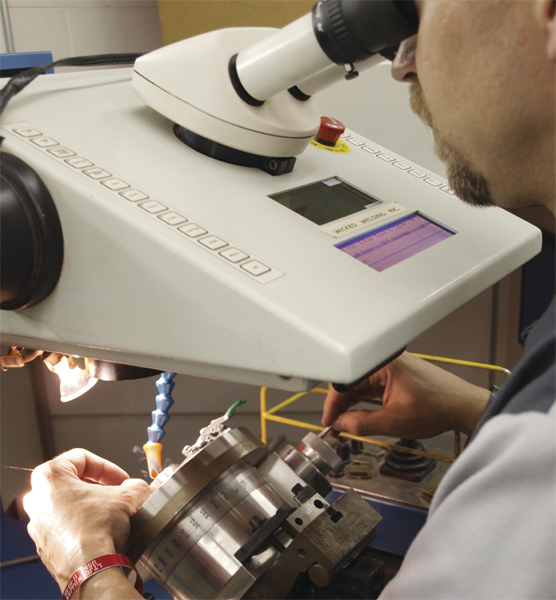 By year-end, Mourouzis should have a third laser-welding system inhouse, this one rated to 200 W.
To maintain these stamping tools for Dayton Systems Group, Mourouzis deposits tiny, precise laser welds to hold replaceable carbide inserts in place. When we visited the welding shop, customer Jon Ledford, DSG manufacturing manager, was there picking up some recently repaired tools. DSG supplies the can-making industry with production systems, sheet-feeding lines and tooling. Ledford explains that at one time, brazing was used to assemble the inserts into the tools. However, the process proved messy and slow, and it was difficult to remove the inserts when they needed to be replaced. 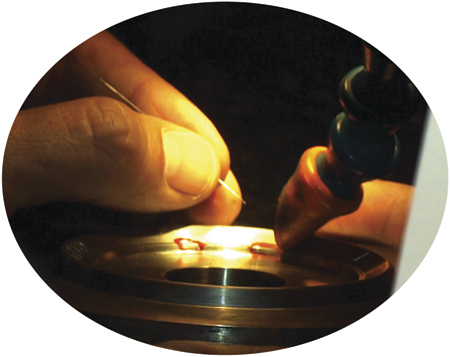 While micro-tig welding requires what most would call thin filler wire—down to 0.010-in. dia.—filler wire for laser welding is hair-thin, as delicate as 0.005-in. dia. M2 filler wire is a favorite of Mourouzis and his crew. 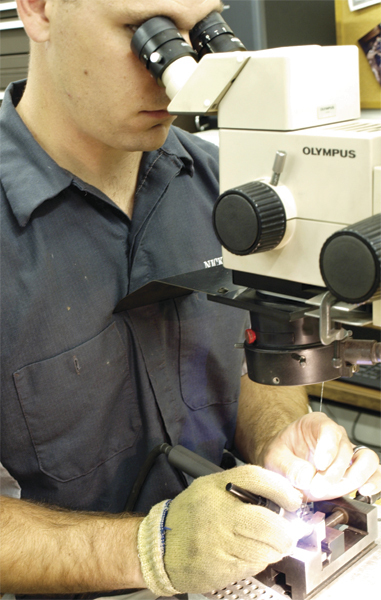 A Wicked Welding operator peers through a stereomicroscope to deposit precise micro-tig welds, while feeding thin filler wire into the weld. A gas lens on the air-cooled tig torch, in place of a standard tig-torch collet body, optimizes shielding-gas coverage and improves joint accessibility. To laser-weld DSG’s tools, Mourouzis hand-holds the parts in the small laser-welding machine. “I’m performing three operations at once,” he notes: “I have to manipulate the part under the beam with my right hand, feed the filler wire into the weld with my left hand, and use a foot pedal to control the laser. 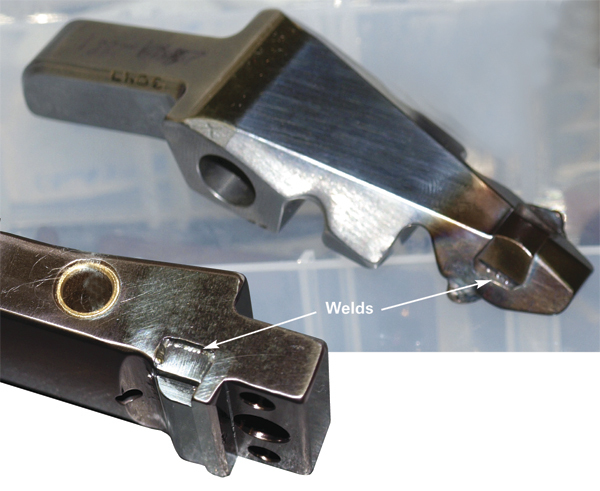 “We tried to make the tiny welds holding the carbide inserts in place using the micro-tig process,” continues Mourouzis, “but even that precision process deposited excess filler metal. DSG didn’t want to have to mill off any extra material. Also, even micro-tig would cause slight discoloration; laser welds don’t. When using the lasers to build up weld metal—to restore a cutting edge, for example—Mourouzis can deposit as much as 0.008 to 0.010 in. per weld pass. Yes, it’s a slow process, but “if you only need 0.005 in. on a tool and I don’t have to preheat,” he reminds, “the time savings is significant.” For work as refined as rebuilding a cutting edge, Mourouzis will opt for his larger laser welder and can use its rotary fixture table on round parts. Micro-tig welding at Wicked Welding is what you’d see at most other precision welding shops—air-cooled torches with gas lenses in place of collet bodies to optimize shielding-gas coverage; pulsed inverter power supplies (Miller Electric 200-A Maxstar and WeldLogic PA-100 units) running DC for most jobs; and finely ground 2-percent lanthanated tungsten electrodes. 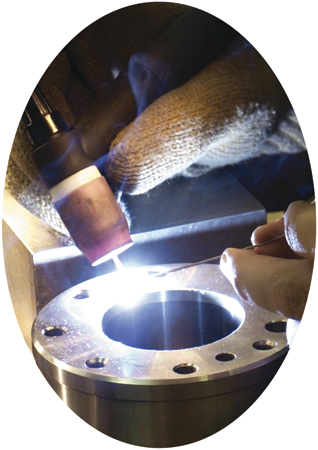 Shielding gas is pure argon—also the gas of choice for laser welding. See also: Rofin-Sinar, Inc., Miller Electric Mfg. Co.